Just take a look at this beautiful solid oak entertainment center. It can be built to hold up to a 32” or 36” TV depending on your needs. It features sturdy bifold doors at the top, a generous equipment shelf in the middle and plenty of storage down below. The back is made of solid oak veneer. 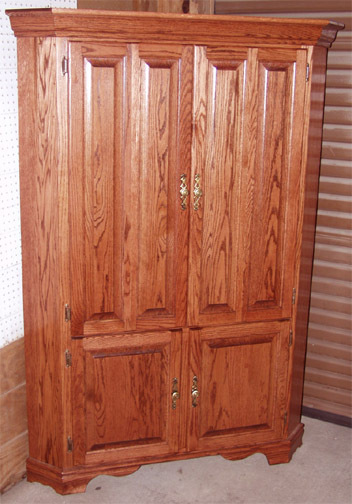 This one is shown with a red mahogany stain applied, but you can choose from any of our available stain colors. Stands 72” tall, and needs minimum 32” from corner on both sides for 32” TV size, or 36” from corner on both sides for 36” TV size in order to fit.